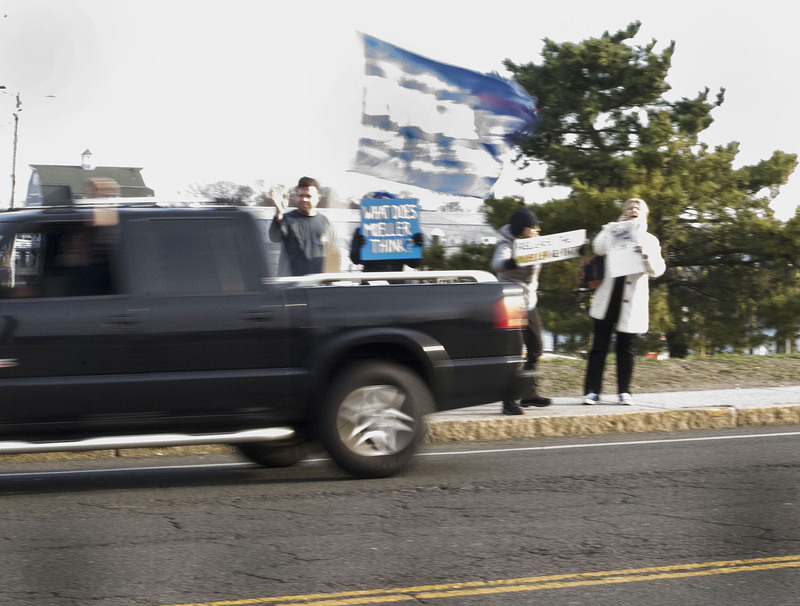 A man with a Trump flag passes anti-Trump protestors Thursday on the Stroffolino Bridge in SoNo. The Rev. Paul Juchniewich, otherwise known as “Pastor Paul,” Thursday in SoNo. NORWALK, Conn. – The Mueller Report drew a small band of protestors to the Stroffolino Bridge on Thursday, a minor reprise of a large November protest. “Go home snowflakes, go home,” the Rev. 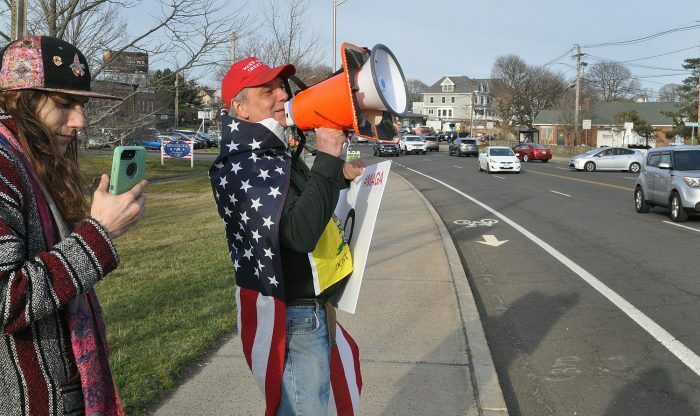 Paul Juchniewich, otherwise known as “Pastor Paul,” yelled from the north side of the bridge as cars passed, while the people on the other side quietly demonstrated in favor of a public release of the Mueller Report. That interaction resulted in a heavy Norwalk Police presence. About 15 protestors were on the south side of the bridge Thursday when NancyOnNorwalk arrived about half an hour after the protest’s scheduled start time. “Their numbers are diminishing. 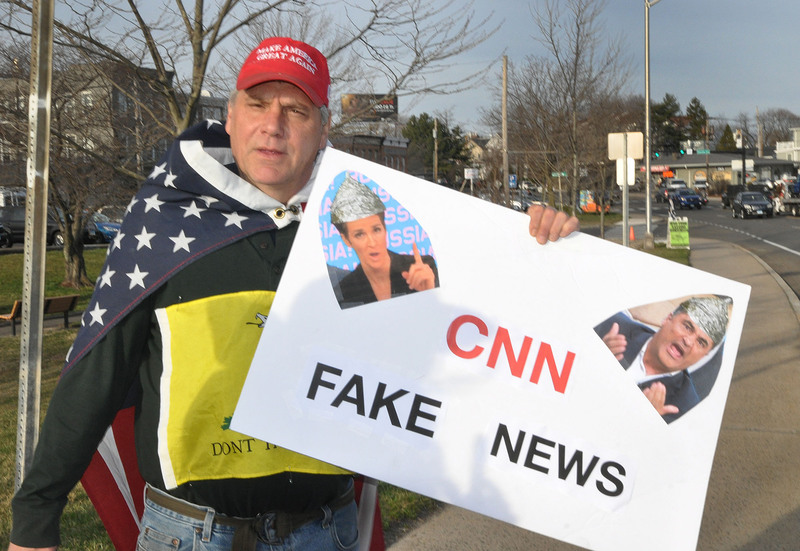 More and more people are becoming disheartened because there was no collusion, there’s no obstruction – they are giving up, it’s over,” Juchniewich said to NancyOnNorwalk. A man in a passing pickup truck yelled a vulgar and homophobic insult directed at Trump. Another pickup truck drove past with a very large Trump flag waving. That truck circled back to pass the protestors on the other side. Attorney General William Barr on March 24 released a four-page letter summarizing Mueller’s report, which did not include a finding of collusion between President Donald Trump and the Russian government. The report left unresolved the question of whether Trump obstructed justice, and Barr’s memo stated that it did not exonerate Trump. 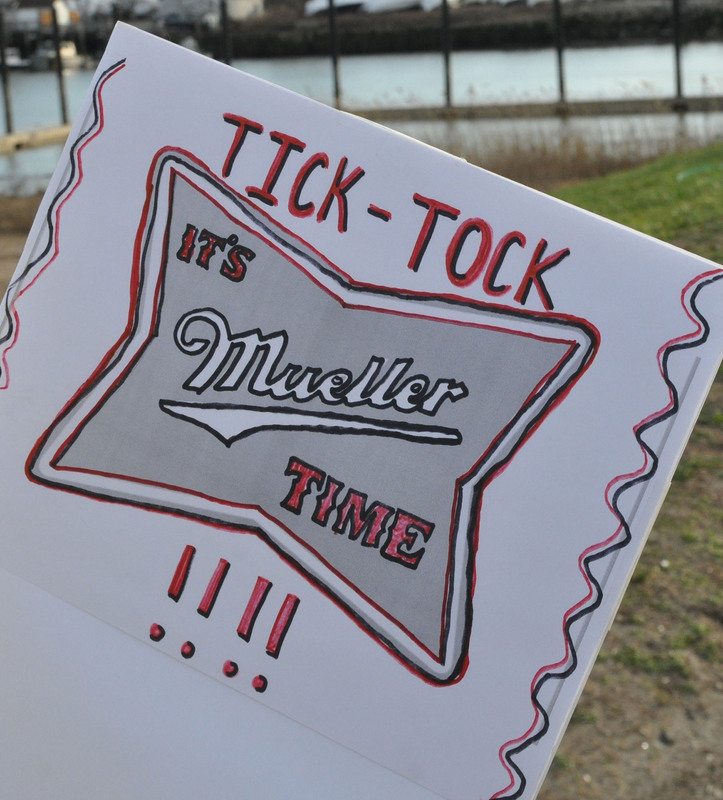 The full Mueller Report, reportedly close to 400 pages, has yet to be released. Democratic commentators say that Mueller himself must have included a summary in the report, and question why that wasn’t released instead of the summary issued by Barr, a Trump appointee. On the other side, Debra Bono of Westport, one of five protestors still on the bridge explained why she wanted the report’s release. Bono said she didn’t know how many protestors had been out there earlier, as she arrived late. A woman who would only give her first name, Kim, said there had been up to 40. Trump trolls sign up online when an event is advertised to mislead people into thinking many people will turn out, she said. A lot of passing motorists gave the protest a thumbs up, Bono said. “He’s in keeping with the ignorance that I see out there,” Bono said. Janet and Kim, who said she lives in Stamford, said they don’t disagree about the Clintons. “People like him think we’re in a football game. ‘It’s our side, we won,’” Janet said, listing issues she considered “important” including international relations, the environment, and racial differences. Kim mentioned economic disparity and expressed concern for small businesses. Kim said she’d supported Bernie Sanders, then Clinton. “I just like coming, being counted,” she said, so that people know they’re not alone. “Maybe you don’t have the courage or a warm enough coat to come out and protest, but you’re not alone,” she said. 2016 Russian manipulation has already been proven, resulting in numerous indictments. Under the emoluments clause of our Constitution, Trump was guilty of an impeachable offense the moment he took office. His list of other crimes is legendary. He is unqualified, incompetent, dishonest, and amoral. None of this matters to his fans, and unless the Democratic Party quickly unites in support of a worthy candidate, we’ll have four more years of wrongheaded irresponsible governance. Not a bad Job reporting Nancy. It was nice to see you again. … and Yes I am a Met Fan. Wasted energy people. Go volunteer for something useful. You hit the nail on the head Mitch and Karl! They have lost their minds, lmao at them! Your argument will be better received if you omit insults and namecalling. I’ve deleted two comments, one with the phrase “RepubliCONS” and another with the phrase “democRATS”. This seems like a bad place for a protest. I assume there no was permit for this. Good thing there weren’t any accidents on this busy bridge.